Our Google Docs integration is now live, along with our existing integrations with Google Sheets, Google Slides, and Google Maps. This means you can easily insert Google Docs onto your slides and signs right through the slide editor. 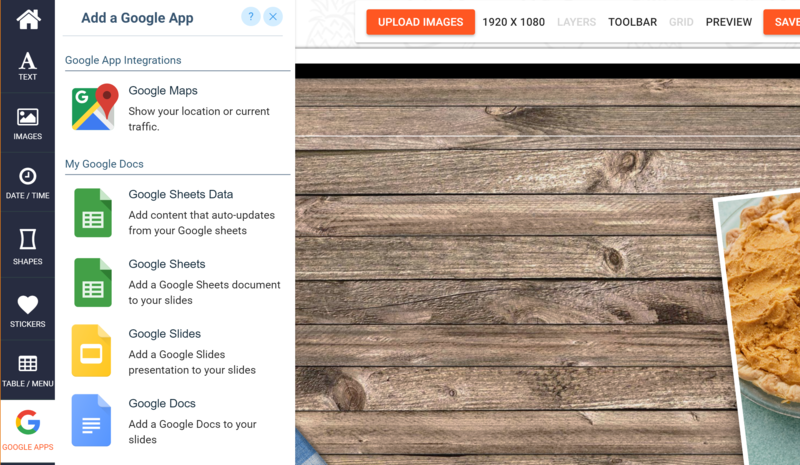 Simply click the Google Docs app in the MangoSigns Editor and browse through your Google Docs and follow the instructions listed to add them to your slides. Any updates you make to your Google Docs will automatically show up on your signs without having to update anything within MangoSigns. Find out more about the new Google Docs integration here. With our previous integration of being able to pull data from your Google Sheets to your slides and customize the fonts and style, we have also launched the ability to embed an entire Google Spreadsheet into your slides. Find out more about the new Google Sheets integration here. We have fixed a bug that occasionally did not allow the slideshow app to automatically advance the second time the slide played.